Okay, I have decided it is about time I post some Cinnamon Rolls on this blog. I was spoiled rotten when it came to cooking while growing up. My mom never made store bought cinnamon rolls, they were always homemade. Cinnamon Rolls are a huge deal in my family. A few years ago, my mom made cinnamon rolls to take to the neighborhood friends for the holidays. I watched her spend all day in the kitchen preparing, baking and frosting cinnamon rolls to take to the neighbors, friends and family around Christmas time. When you are baking cinnamon rolls for 30-40 families, you would probably be in the kitchen all day too, maybe even the whole week! As a kid, I knew they tasted delicious, but I had associated being in the kitchen all day in order to make them. I don’t know if any of you ever have had a food, meal, or dessert that the very thought of cooking or baking it completely makes you change your mind about making it. That had become cinnamon rolls for me. I LOVED them, but I was scared to death of making them… weird I know. and add some DELICIOUS frosting on top…. …and you get a little swirl of heaven. MMM! Mix milk, oil and sugar in a sauce pan. Scald to 150 degrees. Let cool until mixture is lukewarm (about 30-45 minutes). Sprinkle in the yeast and let sit. After the yeast sits and activates, add in 4 cups flour. Stir the mixture together. Cover and let sit for one hour. Add in 1/2 cup flour, baking powder, baking soda, and salt. Stir or knead mixture together. Divide the dough in half. Sprinkle surface with flour and roll dough out to form a thin rectangle. Smear a generous amount of softened butter over surface of rolled out dough. Rub brown sugar over the buttered surface of rolled out dough. You just want a thin even layer. Sprinkle with cinnamon. Fold the dough toward you. Pinch the seam to seal it. Grease a foil cake or pie pan, or do like me and grease a cookie sheet. Cut rolls 3/4 to 1 inch think and lay on greased pans. If you do the cookie sheet method like me, lay them in 3 rows of 3. Repeat with the other half of the dough and filling. Cover rolls and let sit for 30 more minutes. Bake at 375 for 15-18 minutes for cake or pie pans and 10-15 minutes for cookie sheets. To make frosting: Cream softened butter and softened cream cheese together. Add vanilla powdered sugar and milk. Add more powdered sugar or milk to get it to your desired consistency. I like my frosting thicker so I add a little more powdered sugar. Once Cinnamon rolls are cooled, frost and enjoy! These look amazing....I'm going to try them this weekend :-) Thanks for sharing! Those are beautiful. My family is the same way about cinnamon rolls. And I make them every Sunday. Life wouldn't be the same without them! I finally figured out how to comment on your blog... use Firefox!! Internet Explorer has been giving me issues for MONTHS now. I thought it was Blogger.Anyway, I can't wait to try these! 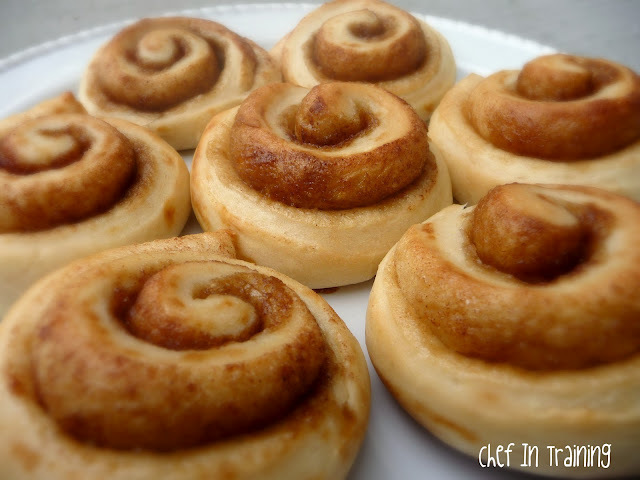 I have a great recipe for cinnamon roll dough for the bread machine but I think I want to try these. They look amazing!! Those look delicious and somehow cute. Must be the roundness. I think it's about time I made some Cinnamon Rolls too! Looks very yummy! I love the smell of cinnamon in the house! 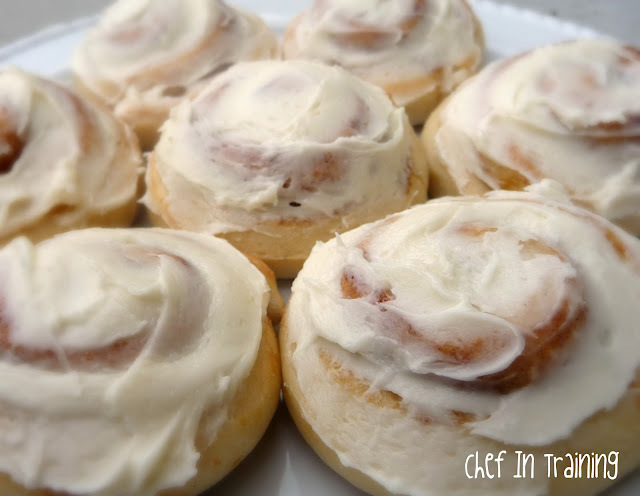 With your frosting, I wish I could have a bite of this lovely rolls! I saw this delicious recipe on TipJunkie! Your blog background is great! Oh please oh please oh please would you like this to the Holiday Sweet Swap that I'm co-hosting? This looks fantabulous and both my husband and I LOVE cream cheese frosting! Jump over to thestokerkitchen.blogspot.com and you'll see the link on the left sidebar. I SO know what you're talking about and I've bit the bullet too and found recipes that weren't as hard as they were in my mind! Thanks for sharing at Church Supper! They are perfect cinnamon rolls! Yummy! Oh yeah, I feel that way about my Grandmother's Biscotti-all day long process, one day I will make them!! I have been carrying the recipe around for thirty years!! I have been looking for a cinnamon roll recipe for a while now and I tried these today and they went down a treat with the family (and the dog) thanks for sharing! I made these with a puff pastry sheet I had on hand and the homemade icing without the cream cheese as I didn't have any, wonderfully delicious and the pastry sheet made it light and fluffy. YUM! Was wondering if you could use water instead of milk? Great Recipe. Thanks. I think I found a new way to get my son to vacuum the whole house.